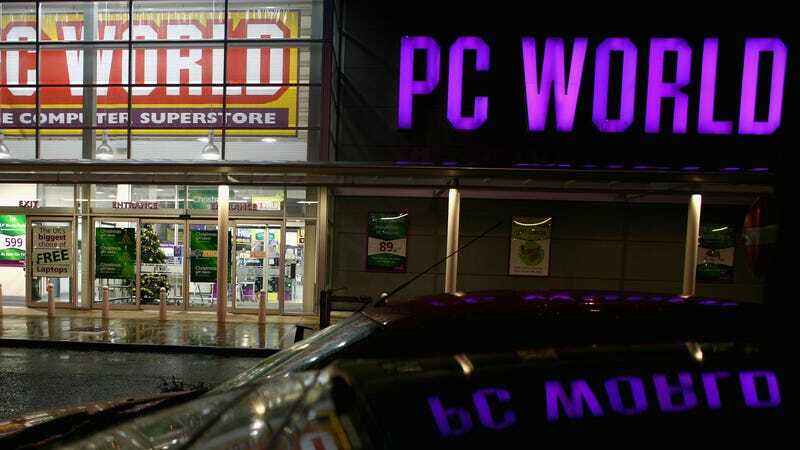 A customer walks out of the PC World store at Braehead Retail Park on November 27, 2008 in Glasgow, Scotland. Dixons Carphone, one of Europe’s largest electronics retailers, disclosed a data breach on Wednesday involving 5.9 million payment cards and 1.2 million personal records. “As part of a review of our systems and data, we have determined that there has been unauthorised access to certain data held by the company,” the company said. The BBC reports that the hacking attempt traces back to July 2017. An investigation at the company is ongoing. Dixons Carphone, known formerly as Dixons Retail, merged with British cellphone provider Carphone Warehouse in 2014. The company also operates the street-side home electronics stores Currys and PC World, often in the same location, as well as Dixons Travel stores. The company’s brand is a household name in the U.K., akin to Best Buy in the U.S.
Dixons said it has since secured its systems and has, as of yet, found no evidence of the illegally accessed data being used for fraud. The company has also been in contact with the police, as well as the U.K.’s data privacy and financial authorities—the Information Commissioner’s Office (ICO) and Financial Conduct Authority, respectively. “Cyber crime is a continual battle for business today and we are determined to tackle this fast-changing challenge,” Baldock said. But otherwise, experts say the damage—both to the victims and to Dixons’ brand—could be severe, though most urged patience. It remains unclear whether any of the data was actually put toward illicit use, they note. Only time will tell. “I would advise anyone concerned keeps an eye on their bank accounts and watches out for obvious phishing attempts,” he said. Dixons noted in its statement that approximately 5.8 of the 5.9 million payment cards unlawfully accessed included chip and pin protection. “The data accessed in respect of these cards contains neither pin codes, card verification values (CVV) nor any authentication data enabling cardholder identification or a purchase to be made,” Dixons said. Around 105,000 non-E.U. cards, which do not have chip or pin protection, may have been compromised, however. Leigh-Anne Galloway, cybersecurity resilience lead at Positive Technologies, said that any attempt to brush off concerns about stolen cards with chips and pin codes suggests a “lack of knowledge about how these cards work and the risks.” Chip-and-pin cards can still be cloned, for instance, to void those measures.